Currently viewing the tag: "Rahway"
On Sunday, Dec. 11, Ebenezer A.M.E. Church, the oldest African-American Church in Rahway, presented the Rev. Erika D. Crawford to the City of Rahway. Rev. Crawford was appointed to pastor Ebenezer in June by bishop, the Rt. Reverend Richard F. Norris. Rev. 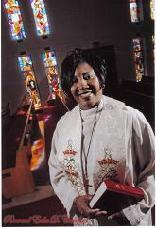 Crawford is the first female pastor in Ebenezer’s long history.